NASA’s Hubble Space Telescope is back in business, ready to uncover new worlds, peer ever deeper into space, and even map the invisible backbone of the universe. 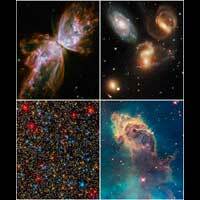 The first snapshots from the refurbished Hubble showcase the 19-year-old telescope’s new vision. Topping the list of exciting new views are colorful multi-wavelength pictures of far-flung galaxies, a densely packed star cluster, an eerie “pillar of creation,” and a “butterfly” nebula. With its new imaging camera, Hubble can view galaxies, star clusters, and other objects across a wide swath of the electromagnetic spectrum, from ultraviolet to near-infrared light. A new spectrograph slices across billions of light-years to map the filamentary structure of the universe and trace the distribution of elements that are fundamental to life. The telescope’s new instruments also are more sensitive to light and can observe in ways that are significantly more efficient and require less observing time than previous generations of Hubble instruments. NASA astronauts installed the new instruments during the space shuttle servicing mission in May 2009. Besides adding the instruments, the astronauts also completed a dizzying list of other chores that included performing unprecedented repairs on two other science instruments. « “Schoolhouse Crock” Is our Wingnuts learning?